First of all I Love the cooking. I cook for myself, my hole family or for any visitor in our families house. I Nepal have a custom that any visitor who visits our house we should give something to eat and drink. After sharing food many time people told me they really like the taste of the food I prepared. Especially all the varieties of Achars (pickles) or other dishes that are sometimes people have forgotten about. I like to reintroduce the food as they are already for ages very tasty. Sometimes change the recipe a bit to even give it a more better flavour. Nepal is visited by many tourist. Almost all of the people that visit Nepal they start to love Nepal. Probably because of it’s beauty but unfortunately mostly not because of it’s delicious food. 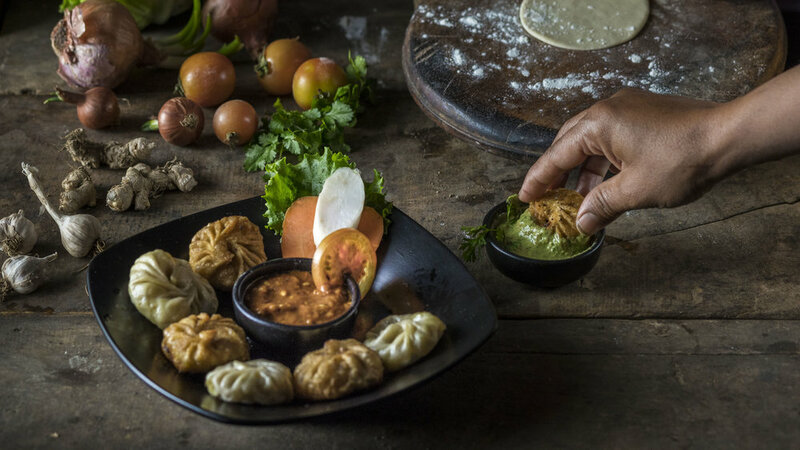 Tourists that visit Kathmandu or Pokhara can chose to mainly eat the food that they are used to eat in their home country. If people go outside of the city then they sometimes travel with a guide, porters and cooking staff. So still they will not taste the Nepali food. Most of the people that have visited Nepal know only about our main dish; Dal Bhat. If they have it in the mountains than it will not be including a lot of variaties. The worst probably is that they haven’t got any other Nepali food than this in the mountains. Workshops kunnen geboekt worden voor groepen van 4 tot 12 personen. Hiernaast is het mogelijk een programma op maat samen te stellen. Steamed dumplings filled with vegetable a curry. NEWARI KAJA SET - VEG. In Nepal mostly eaten as lunch. NEWARI KAJA SET - NON VEG. DHAL BHAT SET - VEG. DHAL BHAT SET - NON VEG. Complete set included fried chicken curry and dried buff meat. 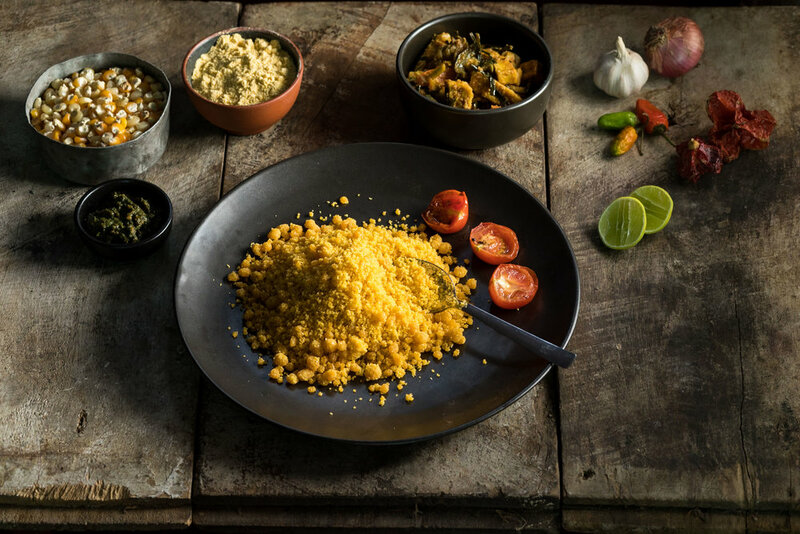 Steamed Rice flavoured with spices and healthy ingredients. A very special Curry made of the cover of a Soya-bean and tomato. Cooked and fried Lentil Soup with a variety of healthy lentils. A nutritious sweet, traditionally eaten by new mothers. Delicious flavoured cubes made from thickened milk and nuts. Famous rice pudding mostly eaten at marriage parties. The best Nepali snacks combined with the taste of Nepali tea and Banana Lassie (curd) shake. There are many combinations possible from the following dishes. Prices mentioned are per person as ingredients have to be bought per person. Choose one of the "Themes", like: "Snacks", "Lunch" or "Desserts"
Choose for a "Lunch" or combine with a "Starter" and a "Dessert"
Choose for a "Dinner" or combine with a "Starter", a "Dishes" and a "Dessert" to make it complete. In Nederland voornamelijk op locatie. Dit kan in overleg op een eigen locatie zijn of op een locatie in de nabije omgeving welke afgehuurd kan worden. 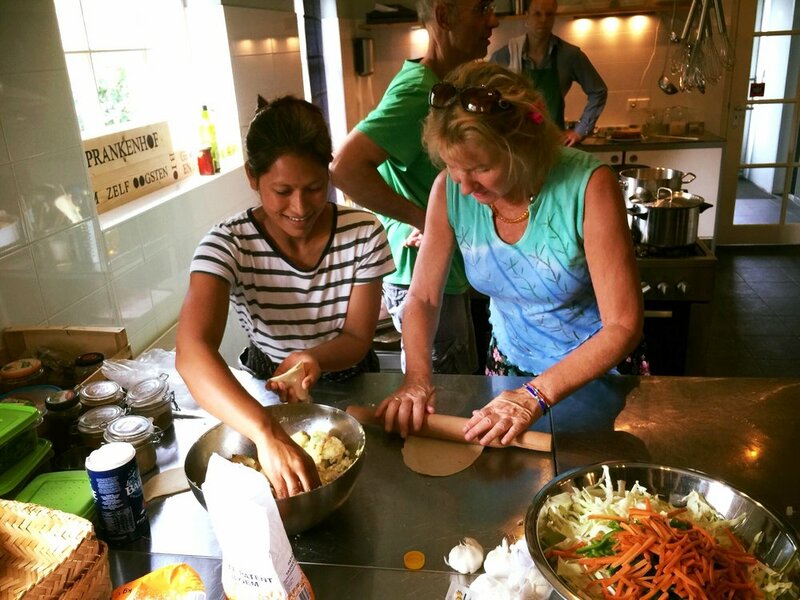 Het is mogelijk om in de periode van 18 november 2018 tot en met 12 februari 2019 een Nepalese kookworkshops in Kathmandu in te plannen. Stuur on je wensen of voorstel middels het onderstaande formulier. In Nepal kunnen workshops georganiseerd worden op onze thuislocatie in de Kathmandu vallei. In de landelijke omgeving zijn vele ingrediënten direct voorhand en veelal biologisch geteeld. Het is mogelijk om in de periode van 16 februari 2019 tot en met 15 mei 2019 een workshops in Kathmandu in te plannen. Stuur on je wensen of voorstel middels het onderstaande formulier. Om een workshop in te plannen van onderstaand formulier met basis gegevens in. Wij zullen zo spoedig mogelijk contact met je opnemen om uw wensen te bespreken. When you like to schedule your workshop ?